Finished reading the first book from my collection since I decided to make an effort to read more books this year. And since I have so many unread books, I set a goal to read at least 60 of the books in my backlog by the end of the year. I finished reading Biceps of Death yesterday when I was supposed to be writing. Oops. 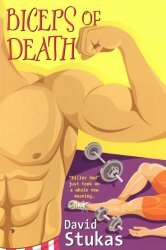 Biceps of Death is a cozy-styled mystery and it was cute. I thought some of the dialogue was a little stilted, but the story pulled me in and kept me reading. It’s the 3rd (or 4th—I’m not really sure) book of a series and I haven’t read the other books so I don’t know how it compares, but I liked it. I have an odd sense of humor sometimes and this book hit the right notes for me. There were some great funny moments in the book that made me actually laugh out loud. :D The book’s available as a Kindle book on Amazon.com. I’ve already started reading another book. I’m not mentioning titles until I’ve actually read each book because book #2 could end up book #8 or some such thing, and while I want to read more, I have no intention of pressuring myself to read anything I don’t want to read. Also, this particular book, I started last year—or the year before, I can’t remember.